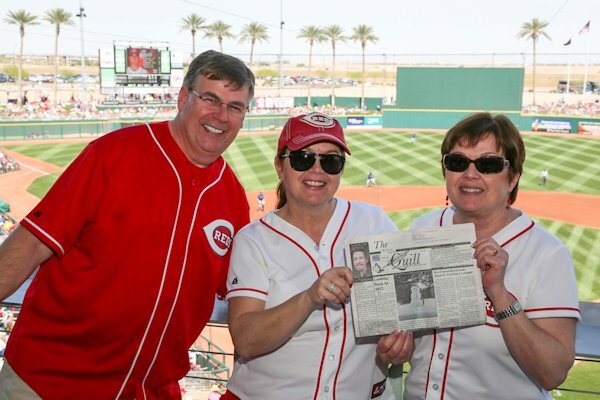 Yale Martin, Becky Martin Kevoian, and Susan Martin Javorsky, along with their spouses, were guests of the Cincinnati Reds organization during Spring Training in Goodyear, AZ. Former Stronghurst residents, the children of Thor and Dorothy Martin are all now living in Indianapolis near their special needs sister, Lynne. They enjoyed the sunshine while everyone back home in the Midwest was getting 9 inches of snow! When you go on a trip, take "The Quill" along and have your picture taken with it and then send it to us. Let's see where all "The Quill" can travel.